Will you, working class English gentleman? Professional sports and alternate history don’t mesh well, simply because the stakes aren’t high enough for us to really care that history was changed. Dwight Clark not making “The Catch” or “The Shot Heard Round the World” dying at the warning track don’t have the same weight and import that, say, the Nazis winning World War II might have. However…in my last blog post, I wondered out loud what effect adding the traditions of Association Football to American sports would have. One of the most, maybe the most, defining traditions of world football is promotion and relegation, a concept as foreign to American fans as…the rest of world football. Relegation is CRUSHING to high level soccer teams, with some taking years or a decade to recover from the lost revenue and prestige. And promotion is a golden opportunity for a team to join the elite in its league. As far as sports goes, it’s life-and-death. So what would an American sport look like with promotion and relegation (hereafter called “P/R” because I’m lazy)? The most obvious candidate to look at is Major League Baseball, with its series of lower level feeder leagues. In theory, it could work. At the end of every season, the four worst MLB teams (this year, it would have been Minnesota, Seattle, Houston and Baltimore) would be dropped to AAA and the four best AAA teams (Columbus Clippers, Sacramento River Cats, Round Rock Express and Pawtucket Red Sox) would be promoted to the majors. Sounds simple and exciting, right? A way to bring in fresh blood and new fans, while punishing underperforming teams. Right? Promoted and facing the Yankees? No thanks. It’s not that simple. Not even close. First, minor league teams are contracted to provide players to the majors. So the teams being promoted would be affiliates of the teams they have to play. What’s to stop the Boston Red Sox from calling up Pawtucket’s best players and cutting out their knees when they have to play? Sure, you could rig the schedule so that affiliates and parent clubs never have to play, but that would be a massive headache. It would violate the spirit of what the minor leagues are: a place for young players to learn the rigors of the game. And since baseball has no salary cap, it would be grossly unfair to the promoted teams. 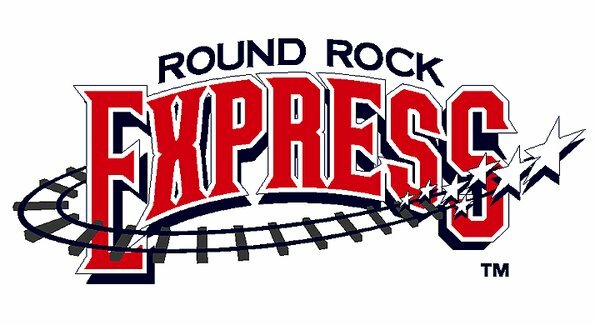 The Round Rock Express might be a great AAA team, but can they beat the Yankees? No, they can’t. P/R in MLB would be a carousel of the same teams going up and down, while giving the top teams easy prey. What would theoretically make the game much more exciting would in fact, make it incredibly boring. So with MLB out (and by extension, the NHL, since minor league hockey teams are affiliates of the big boys), and the NBA in need of contraction more than relegation (you do NOT want to see D-League teams trotted out to play the Bulls and Heat), that leaves us with the NFL to experiment with P/R. In any given year, there about 3-5 really good teams, 3-5 really bad teams and everyone else is within a couple of wins of each other. Sounds like perfect fodder to try relegation. And frankly, with so many worthless games at the end of the NFL season, promotion and relegation battles would be THRILLING. I experienced this first hand when I went to Ireland and was there on the last day of the EPL season. I spent an entire day watching British men in suits excitedly delivering news of the relegation fights in the EPL. Every goal scored changed the future of the league, with teams fighting tooth and nail for the prestige and money of either making it to or staying in the EPL. Having the same battles in the NFL would be incredible. Who wouldn’t watch that? ESPN would crap themselves, knowing that those horrendous Monday night games in December might actually have some impact. It would, in a word, be awesome. Yes, there are drawbacks. Owners would hate it. Fans of NFL 2 teams might too. But fans already support their teams by and large, even when they’re eliminated. And again, think of the drama and excitement of those relegation and promotion games. Each one like a little playoff! So like a 14 year old breaking into his parents’ liquor cabinet, I experimented. Here’s my interpretation of what the NFL with promotion and relegation COULD look like. With 32 teams, the NFL splits nicely into two leagues of 16. We’ll call them NFL 1 and NFL 2. NFL 1 would be the “Premier League” and NFL 2 the lower league, with less TV revenue and no chance to win the Super Bowl. How would those leagues be put together? There are any number of ways to divide up the teams, all of which are equally unfair. You could do it at random, which defeats the purpose of having a premier league. 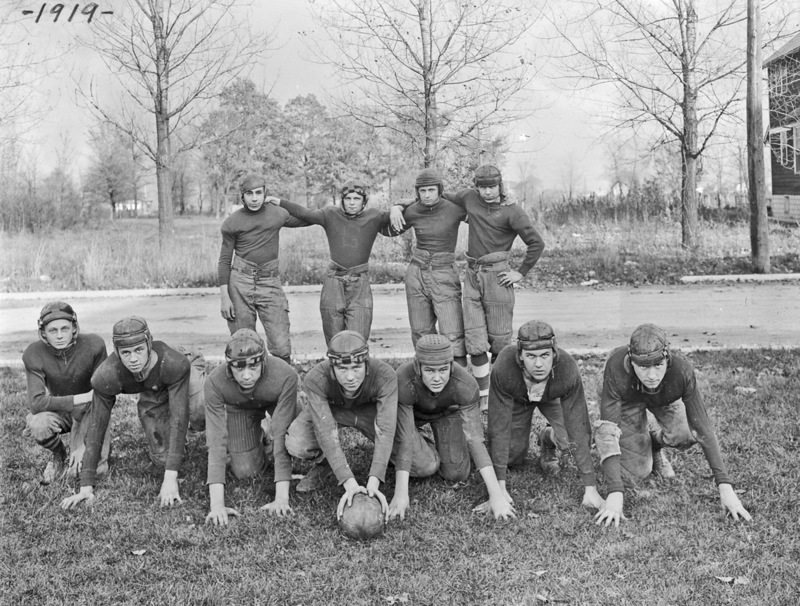 You could do it by the year the team joined the league, but since most NFL teams either joined in the 30’s and 40’s or around the time of the NFL-AFL merger, this would be pretty messy, and also quite arbitrary. The only way to split the NFL in a way that made relegation and promotion make sense would be by record. Again, there are any number of ways to do it. What I did is simply split the league by life-time record. Not super fair, but it’s as good a place to start as any. The 16 teams with the best overall records since their inception are in NFL 1, with the others in NFL 2. NFL 2? Sounds like Communism! Of course, this list doesn’t take into account the real reason we’re doing this whole experiment: promotion and relegation. So I took into account regular season records over the last five years, promoting the top three teams and relegating the bottom three. I realize that makes the initial league setup a bit inaccurate, since technically I’d have to start with overall records as they were in 2007, but I didn’t have that information, and there’s a limit on how much work I’ll do for free. Doing the actual moving teams was a lot of fun. Virtually every team in the league got kicked up or dropped down at least once, which shows the parity in the NFL and how even good teams that have one bad season can get screwed. Going by the records this year, you’d have Minnesota, Carolina and Indy relegated; with San Fran, Detroit and Houston being promoted. All three of them made the playoffs this year, so that seems right. NFL 2 would still be weak next year, but definitely have some frisky potential and a lot of interesting young players. This is easy. 16 teams, 16 games. Each team plays every other team in their league once, split between home and away. The last game can be either a randomly selected second game against a league opponent, a game against an opponent in the other league or a mandated rivalry game. This would ensure that even if, say the Bears and Packers are in different leagues, they’d always play at least once. Sure, you’d have fewer rivalry games, but is that such a bad thing? This is not so easy. Right now, 12 teams in the NFL make the playoffs. Obviously, with 16 teams in NFL 1, having 12 make the playoffs would be stupid. Too many mediocre teams make the playoffs as it is. BUT, I don’t want NFL 1 to simply crown the team with the best record the champion the way they do in Association Football. And the playoffs are the best part of the NFL season anyway. So I started thinking about alternatives that would keep a competitive, interesting playoff. Keep it 12 teams, but have some from NFL2? 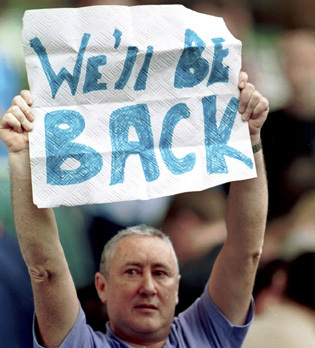 Defeats the purpose of relegation. In fact, I’d argue that having too many NFL 2 teams make the playoffs would be an incentive to be relegated, since you’d have a far easier schedule (I mean, really. Look at those cupcakes!). Reduce it to 4 teams? Not enough. 8? Too many. Finally, I hit on the compromise. The top seven teams from NFL 1 (regardless of division) and the BEST team from NFL 2. This gives you the best of the best, a few frisky mid-level teams, and theoretically gives every team in the NFL at least a chance to win the Super Bowl. The only difference is the Titans making it instead of the Giants. Both were 9-7, but the Titans make it in on point differential. Obviously, there are teams with more wins not making it in the playoffs, but they are getting promoted. 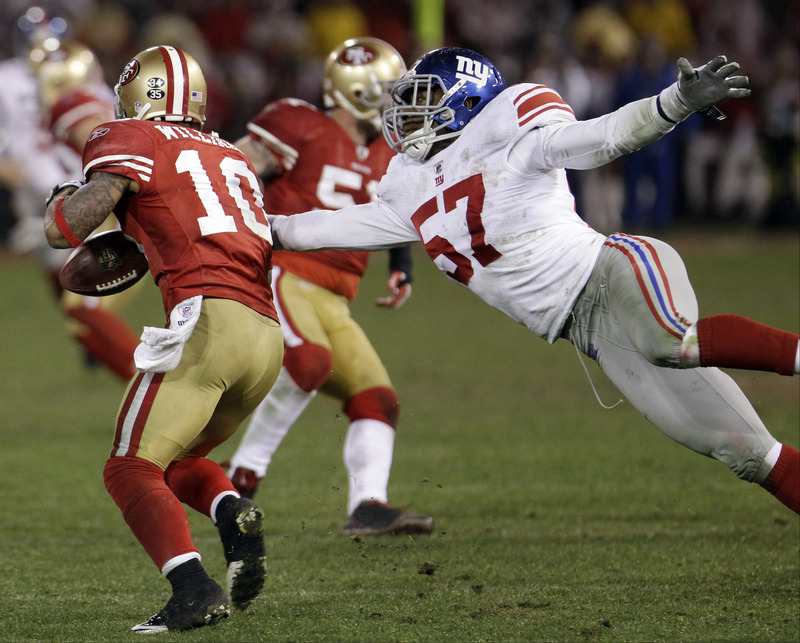 In my alternate NFL, Kyle Williams is off the hook! Having fewer playoff teams means fewer games, so to solve this, I’d make the first round a home and home series, with each team playing the other once at home and once on the road (another Association Football quirk). Ties would be solved by total points. This would give you 8 first round games, 2 second round games and 1 Super Bowl. The draft would still be the draft. No changes to that. Trades would be allowed between the leagues, and trading would probably be a hell of a lot more fun, with teams setting themselves up for runs at promotion. The Pro Bowl would still be irrelevant. This system would make late season games so much more meaningful for so many teams. If relegation truly had a sting to it, those games would each be a playoff. Even teams not in danger of relegation (or with a chance for promotion) could fight to screw over their rivals. It would be awesome. Fewer mediocre teams in the playoffs. Real incentive for every team to get better, not just coast by and make money. Teams in the NFL cycle between good and bad so much that you’d never have too much stagnation for very long. With point differential, there’s always the risk of teams running up the score. The second leg of the first round of the playoffs has a chance to be really anti-climactic. Did I mention owners would HATE this? The NFL is already the most successful sports league in the America. Why shake up a good thing that works? Next time: a national, FA Cup style mega-tournament in baseball. Round Rock Express, have at it!